Evidence is mounting that the South/Eastern Highveld was home to a large concentration of Bushmen or San people who lived in this region due to the abundance of game and availability of water. The Lakeland areas Chrissiemeer and the highly eroded Vaal and Komati catchment areas made this Highveld region highly attractive to these first inhabitants. Numerous rock painting sites and rock shelters with archaeological evidence of habitation by the San are being rediscovered in this area. The La Rochelle cave and Holkrans outside Chrissiemeer point to long-term habitation by this now extinct people. The most exciting evidence to emerge lately is that of Lake Bushmen who literally lived inside the reed pans or lakes which dot the area. During the period when the Nguni, particularly Swazis, started moving into the area from what is today Mozambique, this original indigenous people, the Bushmen, found what to them became an easy source of protein, namely the Swazi's cattle. Taking into account that there were potentially hundreds of Bushmen settlements on the Southern Highveld, over a period of some years the theft and slaughter of Swazi cattle by the elusive Bushmen led, as one can imagine, to major upholds within the Swazi nation. Complaints to chiefs and much debate at gatherings of tribal and clan leaders led to some tribes sending out warriors to hunt the poachers. Bushmen are by nature an elusive people and were able to elude the Swazi warriors. With limited effect and large scale pastoralisation by the Swazi people the situation reached epidemic proportions. Shortage of grazing within the borders of what is now called Swaziland force the king to take drastic action. A general mobilisation of the Swazi warrior's impi’s and their subsequent sweep through the entire region from Utrecht up to Badplaas led to the beginning of the end for the San people. According to oral history and evidence gathered over years of research, it is apparent that this tactic led to the final extermination of the San. Swazi impi’s would have searched every lake area, cliff and valley and we are led to believe that the Bushmen were able to hide in caves, which are plentiful in the catchment areas of the Komati and Vaal Rivers. Those who were not captured were smoked out with bundles of burning grass. Captive Bushmen were then taken to predetermined sites like the murder rock at Breyten and to Ubola River near Wakkerstroom where the males were put to death in their hundreds. Women and children were taken as slaves and concubines and systematically absorbed into the Swazi nation. 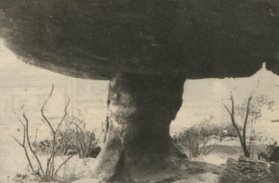 A verbal history tells of a violent rainstorm near Dirkiesdorp / Wakkerstroom which flushed out hundreds of putrefying Bushmen corpses into a nearby river, making the water smell for many kilometres and which led to the renaming of the river to Ubola (Zulu for "something which is rotten").